Joel Embiid and the Sixers have a tough schedule coming up. As the 76ers look toward latter half of the 2018-19 NBA season and another playoff run, they’ll have to make it through this next stretch of the schedule which, on paper, is nothing short of brutal. From Jan. 17 through Feb. 12, the Sixers will play 12 consecutive games against teams in playoff contention, including the elite teams in both conferences. The Sixers have a slate of winnable games between now and the savage run. Brett Brown stressed the importance of gaining momentum before his team faces the league’s best. 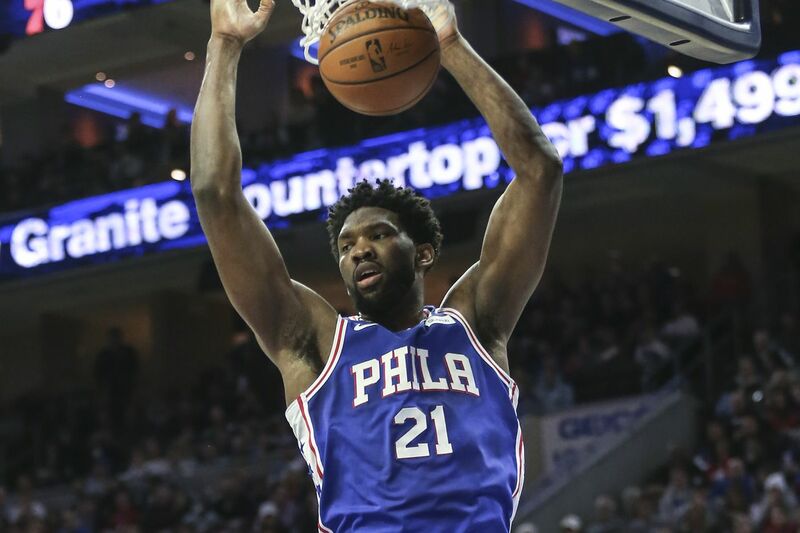 “I think the next four games are our opportunity to play better defense, to get wins under our belt, to get a respectful cockiness, a mojo, a swagger, a belief that we can then take into the royalty and elite of the league,” Brown said after the Sixers 132-115 win over the Wizards on Tuesday. It starts in Indiana on Jan. 17, when the Sixers visit the Pacers in a game that could have playoff-seeding implications: The Sixers and Pacers have been toggling between third and fifth in the Eastern Conference standings for weeks. The Pacers led the Sixers by a half-game going into Wednesday. The teams have split their previous two meetings, with the Sixers winning on the road 100-94 on Nov. 7 then losing at home 113-101 Dec. 14. Then, Sixers will have a three-game homestand against a trio of Western Conference teams that are always a tough matchup. The Sixers play the Oklahoma City Thunder on Jan. 19, the Houston Rockets on Jan. 21, and the San Antonio Spurs on Jan. 23. Each team brings something different to the table: The Thunder have one of the league’s best defenses along with the fire power of Russell Westbrook and Paul George; the Rockets have James Harden, who refuses to let anything slow him down; and the Spurs, no matter their talent, are always a threat. After the homestand the Sixers embark on their toughest road trip of the season: a four-game West Coast swing that kicks off on Jan. 26 against the West-leading Denver Nuggets, who, like the Sixers, have only lost three games on their home court this season. From there the Sixers will be pitted against the Los Angeles Lakers, then the reigning champion Golden State Warriors followed by the surging Sacramento Kings. The games against the Lakers and the Kings might be the only contests in which the Sixers are favored. LeBron James -- depending on how long his groin injury lingers -- may or may not be on the court to help the Lakers, and despite the Kings’ record, which currently has them at 10th in the West, they are a young team that has exceeded expectations and given the league’s best a run for their money. The Sixers will return to Philadelphia for a four-game homestand that will be just as demanding as their road trip. On Feb. 5 the Sixers will have their fourth and final game against the league-leading Toronto Raptors, to whom the Sixers have lost two of the three times they’ve met so far. The Sixers' only victory against the Raptors was on Dec. 22, when Toronto came to Philly and Kawhi Leonard didn’t play. Following that game, the Sixers host the Nuggets, Lakers, and Celtics, the latter of whom have twice bested the Sixers this season -- on opening night and on Christmas Day. Sixers are looking forward to battling against the league’s best. “I’m looking more forward to the second-half of the year," Brown said. “We can take problems and concerns that we’ve had and move on and it has to be first primarily focused to defense. That’s where my head is at."